Another collection of photos from a recent ballooning trip over Victoria’s gorgeous wine-growing Yarra Valley one early spring morning. Perhaps the most gorgeous aspect of the trip was the mist at dawn, and how it interplayed with the landscape as the sun rose, transforming the landscape and changing the mood as it changed. From the ground, the pattern of the mist is harder to discern, but from 3,000 feet, it’s beautiful to watch it steaming off waterways in the cool morning air, spreading like a threadbare cotton blanket over the ground, or catching long shadows from the sun low on the horizon. As we first took off, we passed over a small flooded waterway. The sun was still below the horizon, and we were low enough that the mist still wrapped us. I took a first shot of the mist running off the water (below), and as we skimmed along its surface, snapped the image at the top of this post of reeds reflected in the still surface. Still low, I shot a third image of a tree at the water’s edge (beneath), again enjoying the utter stillness of the water’s surface as the balloon breezed over. As we gained height, the waterways gleamed silver against a dark green backdrop, while mist clumped over low, damp areas. As the sun first began to rise, it sent low shafts of light across the valley, catching treetops and lighting the topside of the mist while depressions remained in shadow. These next three images show the interplay of light and shadow, of mist, tree and water. You can see the mist boiling off the top of the rivers and ponds, much warmer than the cold air sitting atop them, like steam off a cauldron. As the sun rose further, the mist began to burn off, swirling in those pockets of sheltered vale where the air was still and the sun’s reach weaker. The patterns left in the air look like currents in a slothfully meandering stream. In this shot, you can see the local airfield as the mist slowly burns away. Sometimes, as in the below image, the relationship between warm water and cool air was obvious, reminiscent of boiling lakes in Rotorua or Yellowstone, circles and puffs among the striations of ploughed fields. Poplars slice upwards through the fug and sunlight streaks between the boughs, casting long shadows across the top of the mist. As we come back down and the sunlight grows stronger, it seeps through to illuminate the ground, where strong colours struggle through the bleaching mist. Here, rows of vines and orchard trees greet our descending balloon, and a few minutes later we’re through the mist and back on terra firma, watching the last tendrils of fog burn off to a blue sky. The ascent from Phedi to Dhampus is a two-hour slog up stone staircases winding their way through the lush overgrown forest of the Himalayan foothills. Upon attaining the ridgeline along which the village’s little stone cottages are spread, a magnificent panorama opens up in the fading afternoon sunlight. 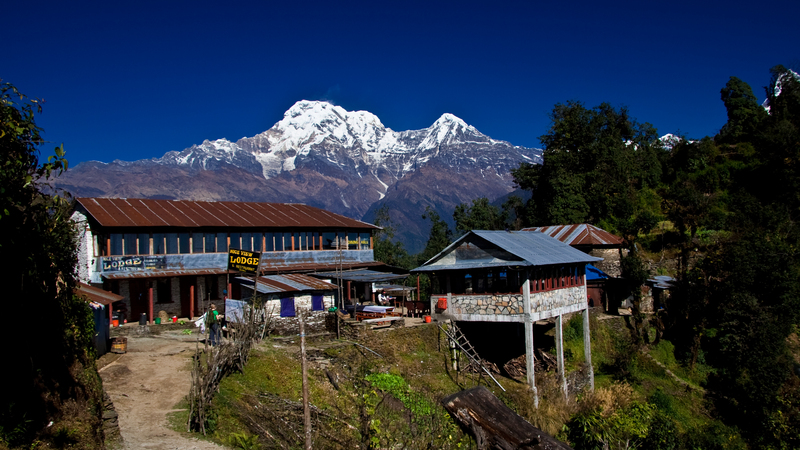 The entire Annapurna Massif is laid out, from left to right some of the most magnificent peaks in the world. 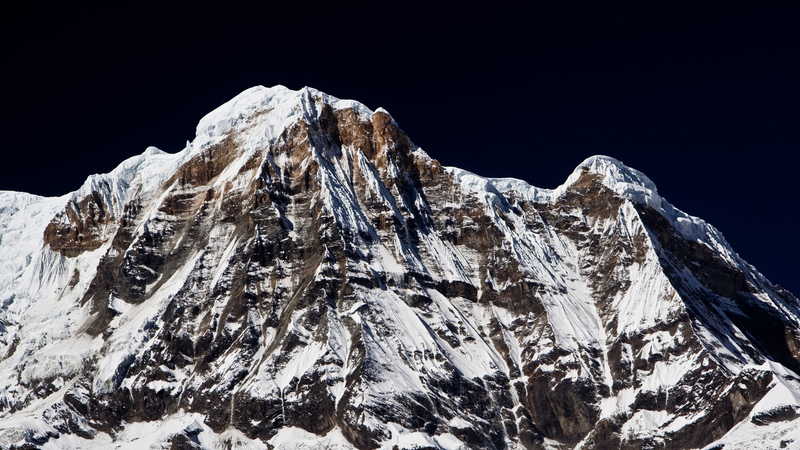 From Annapurna South and Annapurna I in the west, crowned by the dramatic Macchapuchare in the centre, and around to the enourmous Annapurnas II and IV in the east, the view is simply staggering. Pemba, our Sherpa, booked us in at a sweet little guesthouse atop the ridge, where the views remained staggering. 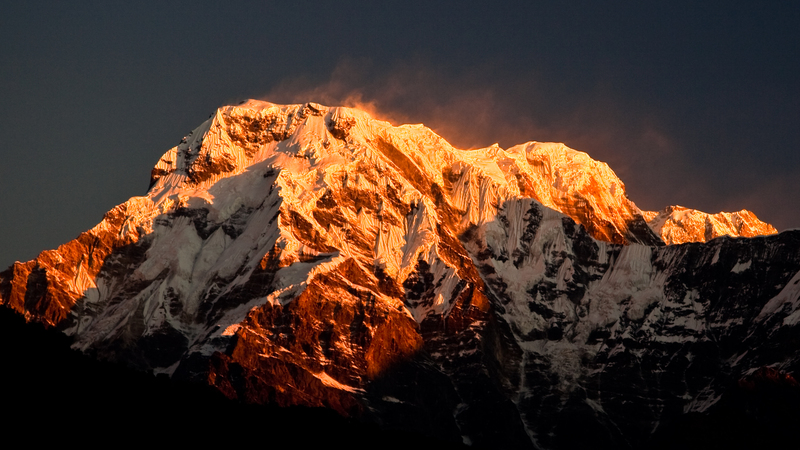 This was only our first evening on the Annapurna Sanctuary Trek, and it was already delivering the goods in spectacular fashion. The accomodation was rustic- wooden beds and thin mats in what felt like a converted stone barn, accessible by a ricketty wooden ladder slippery with years of tred and woodsmoke. I got up early the next morning with Lydz and Laura to watch the sunrise. Our vantage looked over the east-facing flanks of the mountains, so as the sun slowly slipped above the distant horizon, they were washed in fresh sunlight, the low angles emphasising the details in the relief. We were standing four and five thousand metres lower than the peaks at which we stared, and the sunlight kissed their tips while our stretch of hillside was still very much swathed in shadow. The air was very still, and hanging with the smoke from early morning fires. 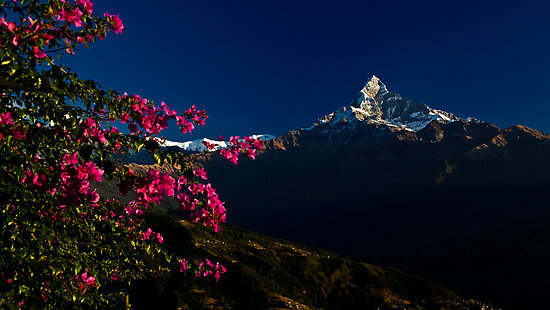 Macchapuchare, or Fishtail Mountain, is known as the Matterhorn of the Himalayas for its distinctive shape and prominence. It is an awe-inspiring peak, and as the sun rose, the light seemed to finger every little crevice and feature on its jagged face. After a little while, the light reached us as well, and a bush exploding with pink flowers in front of me was suddenly bathed in soft light. I balanced a shot with the flowers framing the mountain peak in the background- the sun-splashed petals, the shining peak and the blue sky contrasting with that deep shadows of the valley. The memory of that morning holds a place as one of the most beautiful sunrises I’ve ever witnessed, in one of the world’s most moving settings. The itself photo sits for me as one of the top two or three I’ve ever taken, and I hope you enjoy it as well.